We're famous for our hams but you'll also love our smoked turkeys. This traditional favorite is as American as apple pie is at family get-togethers. Like our hams, only the finest turkeys become Hamlet turkeys. 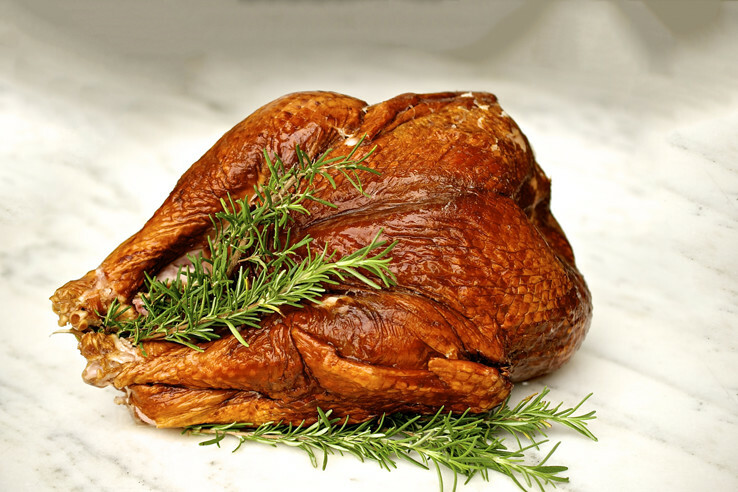 Warming Like our hams, our whole turkeys are fully cooked, making preparations as simple as possible. We recommend serving your turkey cold. If you prefer to heat your turkey, place it fully defrosted in an open roasting pan. Insert a meat thermometer so the bulb is centered in the fleshiest part of the breast. Do not cover. Whole turkeys should be baked in a 300º F over for 1 1/2 hours or until the thermometer reading is between 120-130º F.
Saving Unused portions of the turkey should be refrigerated and consumed within one week. To freeze, wrap in aluminum foil and put in an airtight plastic bag. Starting with the most plump and tender birds, then adding special seasonings and slow smoked to a golden perfection. Each turkey is specially wrapped to seal in the flavor until you're ready to serve. These huge and tender breasts are fire glazed with our honey and spice recipe just like our Honey Kissed Hams. The turkey breasts are spiral cut which makes it easy to serve. Leftovers are as good as the main course!